Charging the Earth - Solar! : Further reflections on Tubes - how many? 26 May 2012: How many tubes would it require to be a satisfactory Solar Earth Charging installation? I am considering it for a whole house, if there was no Sunbox on the circuit. After a couple of months, I am under pressure to come up with a figure and a discussion because I have to write an article for the SET conference in Vancouver Sept 2012. If I could double the number of tubes, it does not always follow that the amount of capture would be doubled also. Presently, I have 2 square metres (15 Tubes). Capture rate is governed mostly by delta-T between the tubes and the body you are transferring heat to, not just the solar energy falling on to the tubes. A tank of water could reach 65ºC, and that is where it would have to end, regardless of the amount of tubes on the roof. The controller has a parameter for highest store temperature. It's better for the tube-ends to get very hot than for the water tank to burst - so it stops. This is "Stasis". Could we reach Stasis in the ground? No, it is part of my ground warming theory that the ground is so infinite in size that it is impossible to reach stasis in this way. There will always be a good delta-T. The Tubes can go right up to 80ºC plus (I have seem them at over 100ºC when the loop was not cooling them), so there is no chance of stasis - the ground loop will not rise above 20º and the highest I normally get is 14º. The heat exchanger is a block of solid metal and cannot overheat. The controller is programmed to stop if the rising liquid from the ground loop is higher than 30ºC. That is still many degrees below blood temperature. The immediate volume of clay that our ground loop is 'talking to' is 3,600 cubic metres. It would need thousands of kWh to raise that even 5 degrees. Long before that, is it winter and the heat pump is pulling the energy all out again. How many tubes would suffice? Without Stasis, the thermal capture from doubling the tubes area could be very close to double - i.e. a one-to-one ratio, pro rata. System losses would play a small part, as the circulating temperature might be higher, but that is a matter of applying good insulation. In summer, the loft is so hot with incidental heat that there is almost no need for insulation. If the present 2 sqm of tubes can make 7 kWh/day, my aim for a hot summer's day would be 20kWh/day, so on that basis, I need to triple the present area to be close to that. If the roof plane could be rotated to face south, they would do less well in the morning, but they would triumph over the length of a whole day. If they were laid with the tubes vertically oriented, they are better able to track the different solar azimuths during the day, and the heat in the copper rods would rise better. So conceivably, they could merely be increased to 4sqm or 5 sqm to achieve a good result. As the tubes are scaleable, a Varisol installation can be modified after a year to add five or ten more tubes if there is space on the roof, and one feels that the system needs tuning. That is why I chose Varisol, because there is no fixed manifold. It would be handy to lay the pipes so that addition of another group of them would be less difficult. Tubes are still more dependent on direct sun than the Sunbox, but if they could get more like 20-25 kWh on the peak hottest days, that would suggest that 6 square metres might be the optimum amount for a house of this size, averaged over a whole year. 4 sqm facing south would be workable, but as with PV, there are Unit costs involved in any installation, so you would be better with the larger amount. The plumbing for tubes is something easier to install (being a frequently installed product) so it looks feasible with a larger area. However, I have no doubt that it requires the addition of a Heat Exchanger. This raises the cost and might be outside the immediate regular experience of plumbers - but it is necessary. 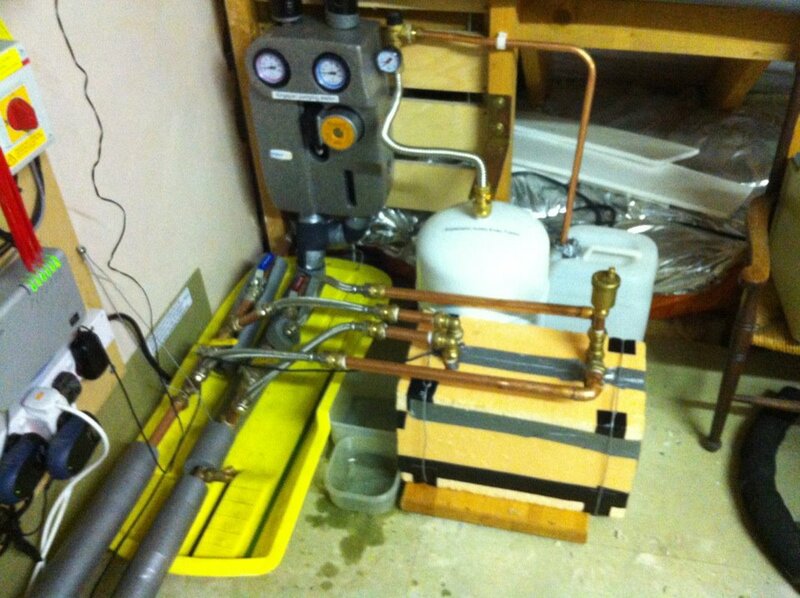 A heat exchanger is vastly cheaper and simpler to install than a water tank. It is very effective at transferring the heat from one circuit to the other. It is dry, watertight, cannot evaporate, freeze, leak or boil. for more hours per day. If one also wanted solar water heating, it would be wrong to use the same tubes, as the temperature range is quite wrong. It would be wrong to use a potable water tank as a heat exchanger. Apart from it being rendered thermally ineffective, there is a risk of Legionnaires disease from water that is fluctuating within a 10-40ºC range. A separate installation of 2 sqm of tubes to a separate water tank would be sufficient and safe, somewhere else on the roof or wall, and the tank can be positioned to suit the convenience of the house plumbing, not the location of the tubes. My recent efforts have shown that the Sunbox is very effective, especially at times when the Sun is not shining. A sunbox using the swimming pool panels requires simpler plumbing and no tank or heat exchanger, and works with the simplest of controllers. Downside is that it requires the construction cost and a suitable wall surface for the construction of the polycarbonate and ETFE box. I am keen to use the ETFE front panels so see if we can push the Sunbox technology further. There is almost no difficulty with installing a row of evacuated tubes on a roof, even in a conservation area, provided one asks nicely. However! a 3 cubic metre, 4 square metre Sunbox like mine is a significant addition to the appearance of the house or building. Although it can be contained within 200mm of the wall using ETFE, it is still highly visible, like a very large window. Bear in mind for all these estimations, that every house is different with varied sizes and insulation levels and peak heating loads, and borehole are of different depths. But the Peveril Solar house is our yardstick, our means of calibrating the requirements for solar charging, for application to any other building or house.